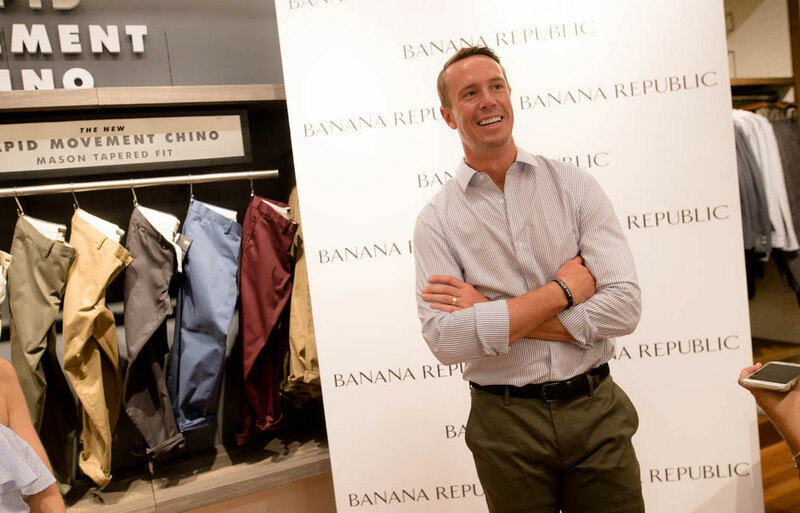 Matt Ryan poses at an event launching the new Rapid Movement Chinos at the Lenox Square Banana Republic. One day before he was due in Flowery Branch for the start of training camp, Matt Ryan took an afternoon to focus on fashion, not football. 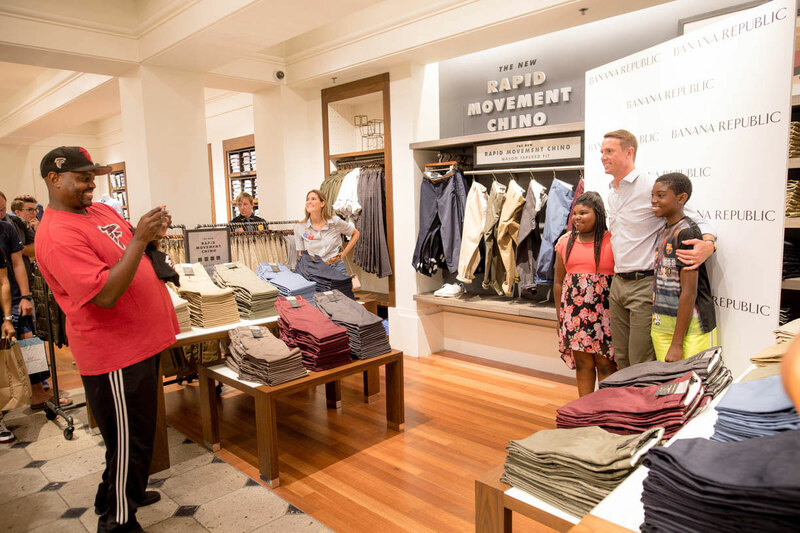 The Atlanta Falcons quarterback stopped by the Banana Republic store in Lenox Square to debut the company’s new Rapid Movement Chino pants—a more flexible, and flashier version of the classic men’s trouser (the pants have stretch for easier movement and are water and stain resistant). Ryan is one of four athletes to comprise Banana Republic’s new Men’s Style Council; along with New York Yankees shortshop Didi Gregorius, Portland Trail Blazers guard C.J. McCollum, and Cleveland Cavaliers forward Kevin Love, he’ll serve as a brand ambassador and appear in the store’s ad campaigns. At the celebration of his new fashionable role, Ryan told us about his long history with Banana Republic, favorite Atlanta food spots, and how he bounced back from February’s Super Bowl heartbreaker to approach the 2017 season. What made you want to get involved with the Men’s Style Council? The biggest thing was the fact that Banana Republic is a store I’ve actually always gone to, and I’ve always worn their clothing. 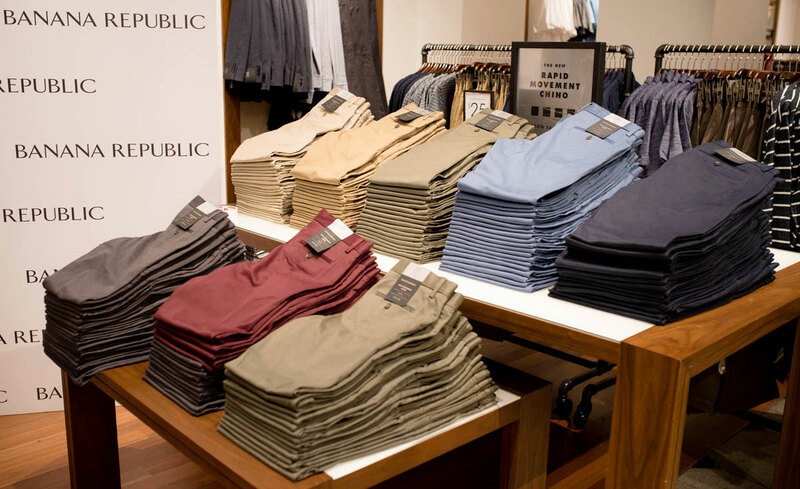 Growing up, it was a big deal to get Banana Republic clothes as a birthday present from my mom. So to be approached and asked to help out was special. What do you like to wear when you’re not in uniform? It’s usually a button down and a pair of chinos, or a white or gray T-shirt. I keep it pretty casual for the most part, but from time to time, I like to slip on a suit. I actually just got fit for a new Banana Republic suit collection that debuts this fall. Matt Ryan poses with fans at the Lenox Square Banana Republic. The new Mercedes-Benz stadium is slated to open in a month. Besides playing on the field, what are you most excited about in the new complex? I just walked through the stadium recently and saw there was an Antico Pizza. I’m pretty jealous that the fans will get to grab a slice whenever they want during games. I may have to grab a slice myself before a game. Where else do you like to go for food and drinks in the city? My wife and I love going to Umi for dinner—their sushi is the best. I also love Decatur. It’s walkable and always has a really friendly vibe. Leon’s is another one of our favorites for food and drinks in Atlanta. Training camp officially kicks off Wednesday. Can you talk a bit about how you overcame last year’s Super Bowl heartbreaker to get ready for the new season? Part of it is just keeping things in perspective. Football is obviously such a big part of my life, and I’m so disappointed by how it all shook out last year, but I also have a lot of positive things in my life. I’m lucky. I think life throws curve balls all the time, and it’s about how you respond to those situations. And the most important step is the first one—which is really just getting up to try again. For me, that was laying out the framework for the off-season and planning for this year. I had some great time off with my wife this summer, but every year at this time, I’m always chomping at the bit. I’m ready to get back on the field and go again.